The OPTICS2 assessment of the State-of-the-Art of research and innovation is done in the context of the Strategic Research and Innovation Agenda (SRIA). The SRIA provides a structure of goals, constituting Action Lines (what is required to achieve the goals? ), Action Elements (How can it be achieved?) and estimated times for the achievement. OPTICS2 sees all the way from the Safety and Security goals through the Action Lines and then down to the level of Elements. Our assessment approach is twofold. 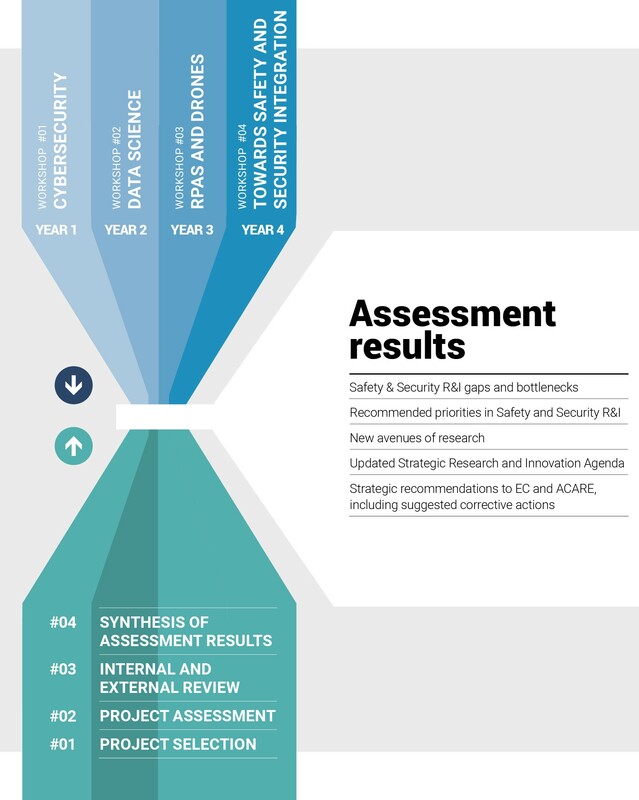 The bottom-up project-based assessment focuses on how safety and security R&I projects and programmes cover the SRIA Action Elements, hence the Lines and goals, and allows the identification of research strengths and gaps, as well as bottlenecks or constraints affecting research progress. But there is always the chance that the SRIA is missing a relevant research avenue. The bottom-up assessment is therefore complemented by top-down activities involving aviation experts.